It's HERE! For all of you bummed that you missed out on the epic Suicide Squad panel at Comic-Con, the full-length trailer has leaked! And we have it here for you right now. The entire Squad makes an appearance, with Margot Robbie's Harley Quinn stealing the show. We also get to see Will Smith's Deadshot in action. But perhaps best of all, we get our first real look at Jared Leto as The Joker. 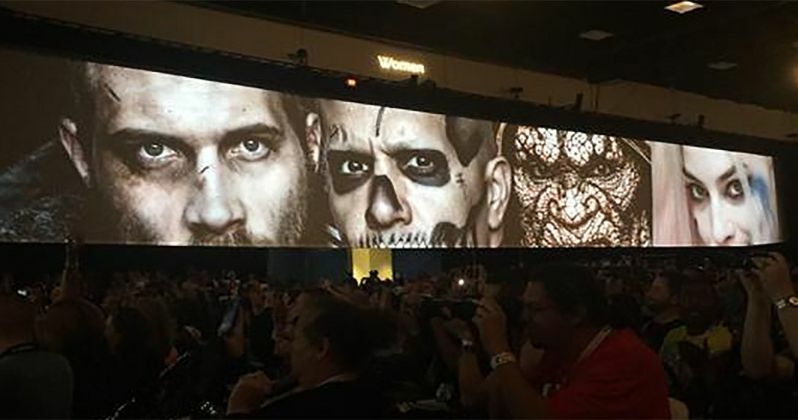 Suicide Squad arrived as one of the surprised during the epic Warner Bros. Hall H panel, preceding the Batman v Superman: Dawn of Justice portion of the show. Director David Ayer teased that he found this footage on the Internet, practically begging for someone to bootleg it! He then brought out the main members of his cast, including Margot Robbie, Cara Delevingne, Jai Courtney, and Will Smith. Sorry, Jared Leto was a no show. Shooting is continuing in Toronto, with the cast flying back this weekend to continue work. The shoot is expect to last through September. The story follows a group of super villains who are forced to form a team for a very dangerous mission, and in turn, they will be rewarded their freedom. As you can see, the movie has some pretty clear connections to Batman v Superman: Dawn of Justice. Take a look and let us know what you think. We'll be sure to update if better footage arrives.